In Stock! 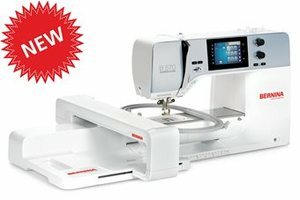 The B 570 QE, made especially for quilters, offers an extended work space, BERNINA Dual Feed, the BSR, 73 quilting stitches, the BERNINA Patchwork Foot # 97, an automatic thread cutter, 9.0 mm stitch width, 7 built-in embroidery alphabets, 250 built-in embroidery designs, 450 stitch patterns and an optional embroidery module with lite embroidery capabilities. Additionally, the B 570 QE has the Triple Stitch Function and Pattern Repeat x 99.